This lesson comes after the lesson "Strokes dissociation" , and can not be approached before mastery the dissociated play. 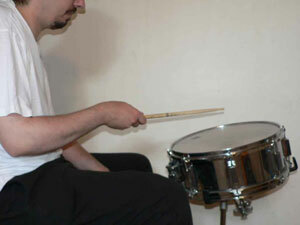 It refers to extremely sharp technical gestures initiated by the European military drummers for the "wrist-arm" (commonly called "Moeller technique ", named after the first American writer to describe it by writing and photos, called by him "Up Stroke-Down Stroke" ), probably Gene Krupa for the wrist-finger and arm-finger (this technique is described in his drum method applied to classic double stroke roll ("daddy-mommy") and called "Bounce", but Dave Weckl called it "pull technique", John Riley "Throwing and Catching motion" and Jean-Baptiste Perraudin, the "Snap"), Joe Morello and Buddy Rich for the accentuation of the second stroke of the same hand in double stroke rolls and see an accomplishment thanks to one handed roll and heel-toe, by the great virtuoso drummers for years 1960, 1970, 1980 ( Elvin Jones (John Coltrane), Tony Williams (Miles Davis), John Bonham (Led Zeppelin), Ian Paice (Deep Purple), Neil Peart (Rush), Steve Gadd (Chick Corea, Al Jarreau, Michel Petrucciani), Dave Weckl (Chick Corea, Michel Camilo, Madonna), Vinnie Colaiuta (Chick Corea, Sting, Frank Zappa), Dennis Chambers (John McLaughlin), to mention only the most famous). These techniques allow almost to double the frequency of strokes with a single limb (one limb roll), reduce fatigue, gain power and get full control of the dynamics (especially the accent on the second stroke of a double stroke ("shuffle") or obtain a absolute regularity ("cleanness") of strokes of a classic roll ("daddy-mommy") at high speed). 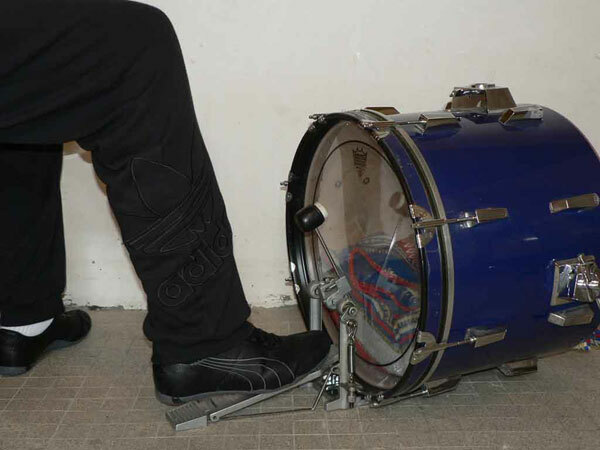 All these motions are to be extrapolated with almost all "rudiments", which I will not repeat here. However in the context of polyrhythms, they can also be used (especially for binary chabada or imitation of the Surdo on bass drum). For myself, I use now the bounce only for very tight rolls and identical double strokes for a very slow tempo (I do all other rolls with alternated strokes (see my video demo)). It is also interesting to work double stroke rolls by passing from on technique to another, depending on the desired loudness (rebounds for pianissimo, wrist-fingers to play piano, arms-fingers for mezzo forte and wrist / arm for forte (see the long roll in introduction of my video demo with joint decelerando and crescendo)). But it is quite possible to accent a hit with apparently less powerful stroke (muscles), it is just a matter of control and it is sometimes useful. This technique allows finally to move quickly from one instrument to another from bottom to top, which is impossible by using the rebound (especially interesting to pass from the ping to the dome of cymbal or hi-hat edge, or from a tom to a cymbal) or make accents in a continuous beat (typical of reggae on hi-hat, with acents of all eighth notes in a flow of sixteenth notes, also widely used in samba or R & B). 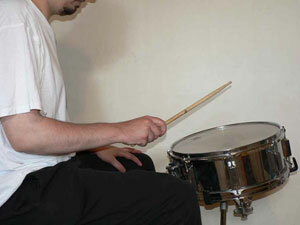 The basic idea behind these techniques is the concept of single stroke roll (alternating between two limbs, one stroke per limb, trying to get the same sound, giving the impression that you play twice fast), but alternating here two dissociated strokes (example: hitting with the forearm (upper arm pulse) and hitting with the wrist (forearm pulse)). To do this, we must as possible "prepare", lift a joint when the other strikes (in a single stroke roll, we lift a limb in a symmetrical movement, at the same time as the other strikes). The positions described here are somewhat different from those of the dissociated hits, but alone. This is why I've decomposed the succession of motions between two strokes of a same limb in several remarkable moments, supported by new illustrative photos and descriptive comments. Finally, acquiring these techniques requires a lot of concentration and patience, but the result is realy worth it (for the reasons expressed in the beginning, because no other technique allows these spectacular results and more and more drummers master them), then do not give up too quickly if you do not control immediately, it would be very normal. At the top of the lifting, the wrist is still broken down and the stick taken of the skin. We are in a position close to the stroke, when the wrist began its lifting and the arm began its descent. Note the position of the thumb inwards here ("snare grip", also commonly called "german grip" today), to prevent it from the striking shock (especially beacause the fingers hitting requires this uncomfortable position of the thumb, one more reason to spare it here (the finger joint is fragile)). When the stick is touching the skin, the wrist is not totally up for the reason of positioning relative to the snare skin. This problem does not exist with the hi-hat, where you can hit the edge of cymbal with the arm with the maximum lifting of the wrist. The arm has not started yet its lifting and the wrist end it. The arm lifting reaches its apogee when the stick touches the skin thanks to the "break" of the wrist. The wrist will be here always "broken" to allow fingers stroke. In the upper position, the hand is closed (finger holding tight the stick). 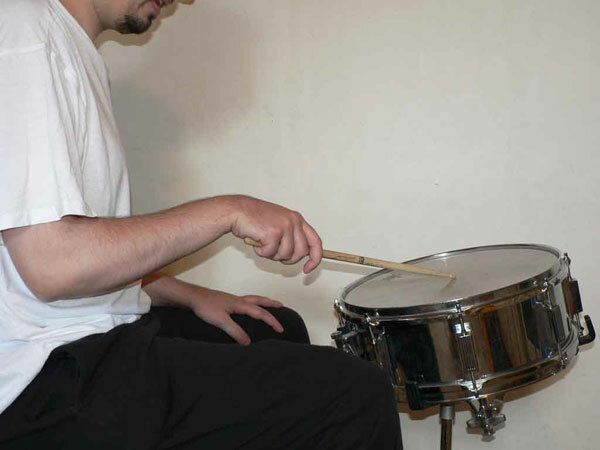 Note that the thumb is here aligned above the stick ("timpanist grip" (in French: "prise timbalier"), also commonly called "French grip" by some teachers which means nothing for me: it's just a matter of apropriate (ergonomic) technique for each instrument and use, gesture*), in opposite to the position of the wrist of the previous alternation to allow a better fingers stroke. When the stick touches the skin, fingers have barely started on their opening to take up the stick (again because of the ergonomics of the snare drum). The arm is still in down position. Use the energy given by the bounce, the grip being very free here. The pivoting of the thumb relative to the index can help to push the stick back. The arm begins its lifting while the stick touches the skin by the action of tightening fingers on the stick (in fact, they getting up to move the stick down thanks to the pivotal movement by the grip "thumb / forefinger "). As before, the fingers are tightened on the stick at the height of the lifting of the wrist (by breaking of course, this is not the arm that lifts). Fingers begin to open when the stick touches the skin. By opening the hand and using the rebound, the thumb and forefinger. 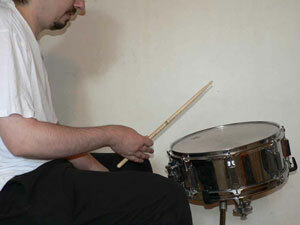 By brutally "squeezing" fingers on the stick, wrist begins its lifting. By the action of lifting of the whole leg and not the toe. Note that the foot never leaves the pedal to avoid a "parasite" stroke against the pedal footboard and an inefficient slow-down. By stretching the leg (knee and hip occurs, no movement of the foot which must be here 'blocked' by an antagonistic action of the muscles). 6 : Rest the heel on the pedal, toe down. This last technique, variation of the first (called also "slide technique" by Dave Weckl because he slides also the foot between the two strokes, which is not necessary), allows to play extremely fast, but is also very tiring. I recommend to save it for quick play only (sixteenth notes triplets, thirty-second notes, etc. ), and to use the previous gesture for medium or slow tempos (sixteenth notes, etc.). 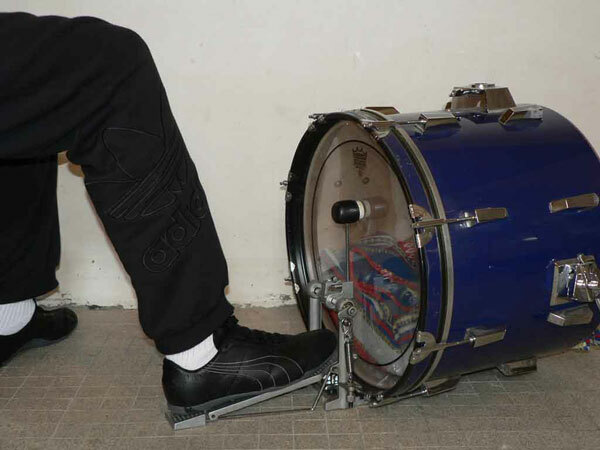 The heel is here in the lowest position for this gesture, but still off the pedal. 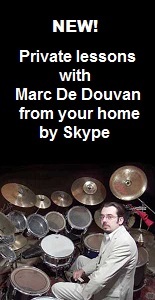 * To precise for the rest of the world, traditional military drummers in every part of the world (even in France! ), since the first european military drummers (swiss), use "traditional grip" ("prise tambour" (literally: "drum grip" in French), with the left stick between the thumb, middle and ring fingers) only because of the depth of drum shell (and not in the case of german snare, in a perfectly horizontal position for march, hence the expression: "german grip", not efficient for fingers stroke, only wrist stroke and sticks turned inward, towards the center of the drum skin), which implies to tilt it to allow to walk, move the legs (make the experience!). It's absolutely not a matter of culture or nationality (first jazz drummers like Baby Dodds were trained in New Orleans carnival brass marching bands, hence the same technique used in modern drumset, which is absolutely not necessary). See the proof with engraving of Napoleonic era here. Timpani when it's played in concert with violins: no need to play fortissimo, but very musical to do fast single stroke roll for ornamentation (the timpani mallets have a very thin handle but large tip generally with felt, which is not appropriate for rebounds which allows double stroke rolls). At the origin, timpani were used on the left and right sides of horses or dromedaries in military cavalry (as long time ago in Genghis Kahn army), and the grip was like for a hammer (ergonomic again!) and probably with thumb up (because of parallel orientation of sticks, to hit in different places, move outwards) but not always played with finger pulse (basic technique is to accent the bass line, crossing sometimes the arms, and rolling with fingers). German army plays also traditional grip! German symphonic percussionists playing with French grip (non sense for me: just timpanists playing the correct grip)?